Washington Monthly | Poor Students Often Lack a Home Internet Connection. Is This FCC Program a Solution? The hunt for after-school Internet connections needed to do homework might soon be over for some of the nation’s poorest students. The Federal Communications Commission voted Thursday to include broadband connections in a $1.8 billion federal program that subsidizes telephone services for low-income people. This program isn’t reserved for families with school-aged children, but supporters say the change will inevitably help the neediest students get online at home. The homework gap, a nickname for the problem, yawns widest for students from the least affluent families. Children from the lowest-income households are “four times more likely to be without broadband than their middle or upper-income counterparts,” according to a recent Pew Research Center analysis of U.S. Census survey data. It’s a problem of increasing interest to national lawmakers. Also on Thursday, two U.S. Senators — Angus King, an independent from Maine, and Shelley Moore Capito, a Republican from West Virginia — introduced legislation meant to discover and support solutions for providing at-home Internet connections for students. The legislation would also require the U.S. Department of Education to determine the scope of the nation’s digital divide for school-aged children. Schools leaders in disadvantaged communities nationwide have sought ways to help those children. 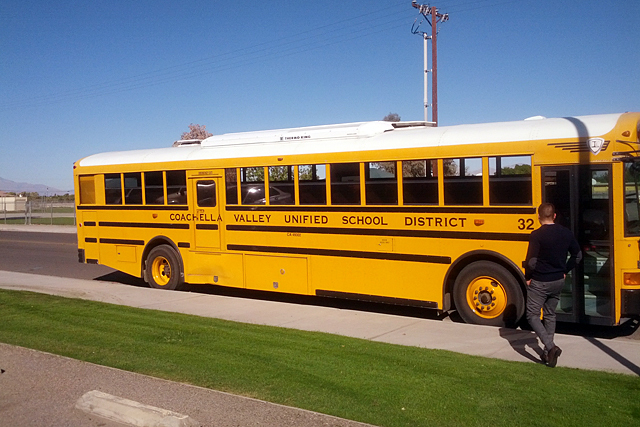 The Coachella Valley Unified School District, in a rural part of southern California, has experimented with Wi-Fi in school buses that are parked overnight in trailer parks where low-income children live. And a school program in an urban community in the state of Washington put Internet hotspots in public housing buildings. Those programs show why the problem will not be easy to fix. Many schools are competing for funding to update their own digital problems, such as antiquated Internet connections, and this makes it more difficult to find the money and time to address at-home connections. An FCC program that subsidizes school technology budgets, which is known as E-Rate, doesn’t help provide access beyond the school walls. Not everyone is convinced that new federal subsidies from the FCC to support home Internet access will solve the problem. FCC Commissioner Ajit Pai, for one, pointed to widely reported fraud and misuse that has plagued the existing program, which provides cell phone and landline service. He voted against changes that would add Internet access to the phone program, saying he believes the new rules do not address the potential for fraud. But the majority of the FCC commissioners supported the measure, passing it Thursday morning by a 3-2 vote. This is the second change at the FCC in recent months that supporters say could expand Internet access for children. In November, a majority of the commissioners approved a $1.5 billion increase in the cap for E-Rate, a federal program that subsidizes Internet and telephone services for schools and libraries. The commissioners also approved changes that would increase the amount of money available for wiring schools with speedy Internet connections, while phasing out financial support for other services, such as telephones. “The realization of the American Dream needs to be manifest in an ever-changing digital economy,” FCC Chairman Tom Wheeler said before he voted to approve changes to the program.